Today we traveled to north Orange County for carpet cleaning in Midway City, California. Midway City is a small town located to the east of Huntington Beach is an area often neglected by many service providers. However, for Green Carpet Cleaning Orange County, it is highly important to cover all the areas of Orange County. And today we had the chance to provide our carpet cleaning in Midway City for a carpet in bad shape. The main reason this customer chose to live in this area is the large back yards. Our customer has 3 dogs that need lots of space to run around and enjoy while he is not home. Therefore, you can only imagine the condition of the carpet after a long time hosting 3 dogs and a couple of adults without a cleaning. in addition to that, add an old carpet and off white color into the equation. Now you can relate to what we walked into right away.While the carpet heavily smells from dog accidents and BO, we advised the customer to try our second to non anti bacterial formula for pet stain removal. In additional to removing the pet stains, it also helps with eliminating bad odors from the carpet and the space in the room. 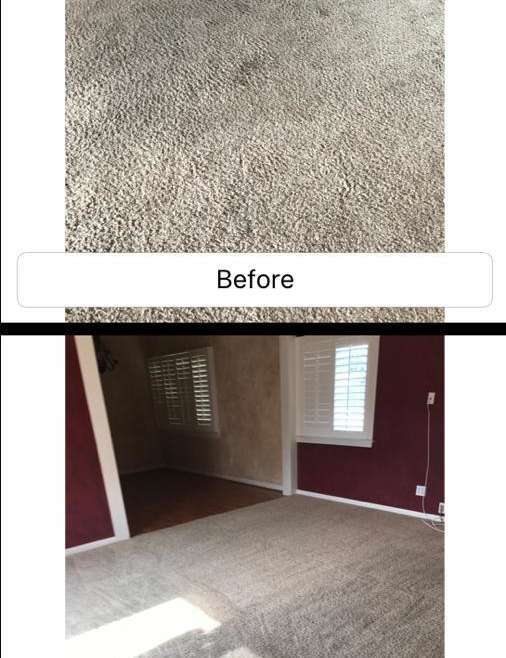 This carpet cleaning job in Midway City was a perfect job for a before an after photo. It truly makes justice with the phrase, a photo is worth more than 1,000 words. As you can tell in the photo attached to this article, the before photo has heavy foot traffic and black & yellow stains all around the carpet. Nevertheless, with our powerful formula we were ale to restore the shine back to the carpet. Also, the customer had told us that the carpet looks better than when he moved in to the house. For more information about our carpet cleaning in Midway City, please contact Green Carpet Cleaning Orange County.